Why DID Washington Cross the Delaware? 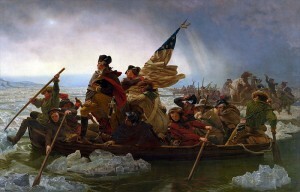 Posted byBrad Hepp December 29, 2012 December 29, 2012 Leave a comment on Why DID Washington Cross the Delaware? You’ve seen the painting…. A noble George Washington leading his troops as they cross the ice-choked Delaware River. If you’re like me, you recognize the scene but don’t remember ever studying the background. I recently listened to an audio book version of David McCollough’s “1776.” McCullough’s reading of his own book is pleasant, devoid of the false energy some readers bring to the narration of other’s writing. In fact, it is the apparent honesty and accuracy of McCollough’s portrayal that give “1776” much of its value. McCullough’s description of George Washington’s outstanding qualities that made him the obvious choice to lead the American army despite his lack of battlefield experience. So, why DID Washington cross the Delaware? Here’s what emerges from McCullough’s narrative…. The troops under General Washington were dwindling at an alarming rate. It was the “Fiscal Cliff” of 1776. He had to take bold actions to re-invigorate what troops were left to him. Unlike the pusillanimous politicians of 2012, Washington risked all to lead his young nation to victory. While I listened to the audio version, and highly recommend it for anyone who has more time to listen than to read, the illustrated print version of the book would surely be invaluable. I do not know the geography of either Boston or New York well enough to envision McCullough’s description of the battlefields. Review of Robert Merry&apos;s "A Country of Vast Designs"
Brad Hepp's Miscellany, Proudly powered by WordPress.